#1. I really LOVE gochujang as an ingredient. #2. 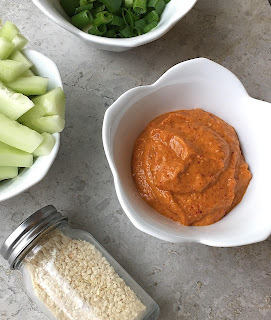 It can be really difficult to find gochujang in most grocery stores! So, I took my favorite elements of the different recipes I tried, and experimented using easy to find ingredients. After a few trials and tweaks to the recipe, I think I've created something you're really going to love! It's a little bit sweet, with a mellow sesame flavor, and you can adjust the heat according to preference. I tried using ingredients that can be found at most grocery stores with an Asian food aisle. I even adjusted some of them to be non-Asian ingredients for those who just don't have access to that kind of thing. So good luck! And if you make this recipe, please post a pic on Instagram and tag me! You'll need a food processor or high speed blender. I use the single serving blender option on our ninja... it's quick. Also, you'll need to blend this once, let it sit in the fridge for an hour or two, and then blend it again. So if you're planning to use it for a specific meal, make it the day before, or at least get it started well before dinner time. Note: if you want a more mild sauce, use only one Tbs of chili flakes, and follow the recipe, tasting when done. If more heat is desired, add another Tbs and repeat steps 2-4 until the flavor suits your palate. You can always make it spicier, but you can't take away heat once it's there. 3. Place the sauce in the fridge for 1-2 hours. 2 hours is ideal but less time will be ok. I usually just put the lid on the blender and stick the whole thing in the fridge. 4. After allowing the mixture to sit, blend again until very smooth. 5. Use the sauce in marinade recipes, as a dipping sauce, or drizzle it on top of your favorite dishes!